They worked all season to take one more step in the World Series. Eric Hosmer wouldn't wait any longer. Hosmer's daring dash forced extra innings, and those bound-and-determined Kansas City Royals rallied yet again to beat the New York Mets 7-2 in 12 innings early Monday for their first championship since 1985. One agonizing win from ecstasy last season, this time the Royals reign after their latest incredible comeback and a go-ahead hit in Game 5 from Christian Colon, maybe the most unlikely player in uniform. Michael Conforto and Steven Matz did everything they could in Game 4, but with the Mets down 3-1 in the best-of-seven set, Matt Harvey represents their final chance Sunday night. Down 2-0 in the ninth, Kansas City fought back against two of the top arms on the pitching-rich Mets: Matt Harvey and Jeurys Familia. And the Royals did it not with home run power but instead an aggressive sprint home by Hosmer on a groundout, a three-run double from Lorenzo Cain, a couple of crucial steals. Never waver. Win it all this time. Wipe the pain away. And next up, Tuesday's parade in Kansas City to celebrate the club's second title, capped with a party at historic Union Station. "Obviously, I let my heart get in the way of my gut. I love my players. 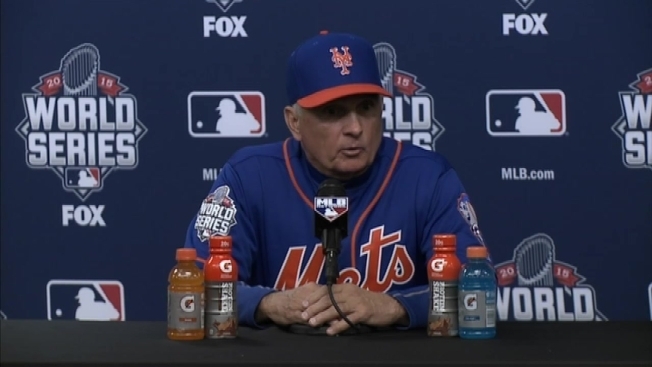 And I trust them," manager Terry Collins said. "It didn't work. It was my fault." New York slugger Yoenis Cespedes exited with knee pain but Curtis Granderson hit a leadoff homer, his third long ball of the Series, and the Mets managed a 2-0 lead against heavy-hearted Royals starter Edinson Volquez, pitching one day after returning from his father's funeral. But for these resilient Royals, no deficit is too large, no time in the game too late. Out in the Midwest, fireworks popped from Missouri to cities all over Kansas. Thousands of fans crammed into the Power & Light District in Kansas City, celebrating as though it was New Year's Eve. Later, the Mets came back onto the field to salute a smaller pocket of fans who stuck around for one last chant of "Let's go, Mets!" "As soon as I saw his head turn towards first, I just decided to take a chance," Hosmer said. "It's a lot easier to take a chance when you're up three games to one, so just felt it was the right time," Hosmer said. "There's no fear in anybody on this team," he said. Hosmer celebrated with excited teammates, while Familia was saddled with his third blown save of the Series, though two were the result of shaky defense. For the rising Mets, flush with young aces, it was the final stop on a storybook ride. Underdogs in the NL East, they re-energized fans at Citi Field during their first winning season since Shea Stadium was still home in 2008, sweeping the Chicago Cubs for their first pennant in 15 years. But the Mets fell short of the ultimate prize and remain without a World Series title since 1986. Cespedes fouled a pitch off the top of his left kneecap in the sixth and crumpled to the dirt in pain. He couldn't even run to first base when he popped out, and was replaced in center field by Juan Lagares in the seventh. 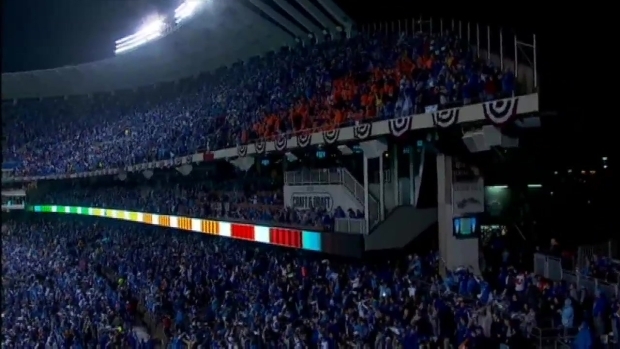 Tony Bennett sang "America the Beautiful" on the field before the eighth November game in World Series history, the first in five years. In an unusual bit of fortuitous scheduling, the teams open next season with two interleague games at Kansas City in early April.